In July, I headed west to San Francisco to attend the Automated Vehicles Symposium Driven by AUVSI and TRB. The most engaged researchers, the most innovative industry representatives, and experienced professionals from transportation agencies and other invested organizations in the realm of Automated Vehicles attended and presented at this event. In a session by Dr. Ensar Becic with the National Transportation Safety Board (NTSB) it was mentioned that crashes will happen and that 94% of crashes are due to human choice or error. That’s an amazing statistic. 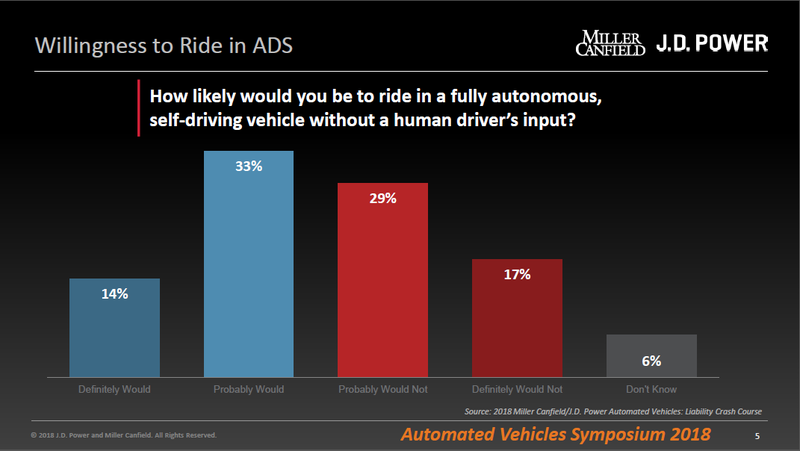 This is an interesting graphic that was included in the presentation titled Bridging the Automated Vehicle Gap: Consumer Trust, Technology and Liability about the Willingness to Ride in Fully Autonomous Self-Driving Vehicle. Looking at the “woulds” vs. “would nots,” it is interesting to note that it’s pretty evenly matched between those that would and those that would not be likely to ride in a fully autonomous self-driving vehicle. I ride the bus to work downtown in Kansas City. One day, I was talking to a fellow bus rider that said she likes taking the bus because she doesn’t have to drive. I asked her if she would like to ride in an autonomous vehicle. She said, “Oh no, I want a driver in the vehicle.” Until we are able to change that mindset, I don’t believe there will be full adoption of autonomous vehicles. In the future, when SAE Level 5 automated vehicles are an everyday occurrence, transportation will be considered a service. Mobility as a Service (MaaS) was a term used by Professor Paul Newman from Oxford. It may not take as long as we think for full adoption of autonomous vehicles. For example, in 1909 Henry Ford began production on the Model T. In 1927 there were 15 million Model T’s on the road. (2) Tech-neutral, not top-down command and control. We will not pick winners and losers among the developers of these technologies. (3) Preference for regulations that are non-prescriptive, performance-based, and seek to enhance safety whenever possible. (4) The Department will work with states and localities to avoid a patchwork of rules that could inhibit innovation and make it difficult for AVs to cross state lines. (5) The Department will provide stakeholders with guidance, best practices, pilot programs and other assistance to facilitate the safe integration of AV systems into the transportation system. (6) The Department recognizes that autonomous vehicles will have to operate side-by-side with traditional vehicles, in both urban and rural areas. Cybersecurity of Automated Vehicles Ecosystem was very interesting. I found there were more ways to attack automated vehicles and infrastructure than I had thought of. Speed Dating in the Legal Coliseum was a unique session where 12 panelists presented a single slide and in four minutes described what their organization is doing, what feedback they want from the audience, and what one policy wish they have for government or industry. At the plenary session on Wednesday, it was brought up about ethics and autonomous vehicles. If a situation presented itself should the car kill the passenger or ten people on the road. My thought was, "let’s not kill anyone." There was a reception with exhibitors and poster presentations each evening. Lidar was a hot topic with the exhibitors and Truck Platooning seemed to be a very popular research topic. I thoroughly enjoyed my time in San Francisco. I came away from the symposium with a few answers and lots of questions that people don’t know the answers to yet. Of course, while in San Francisco, I had to ride the Cable Car to Fisherman’s Wharf to get clam chowder in a bread bowl.